Time For a Few Questions. 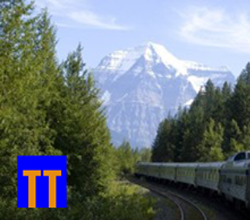 I’m happy to take your questions about train travel in North America. Just post your question as a comment on the blog or send me an email at Jim@trainsandtravel.com. If I don’t have the answer, I’ll know someone who does. Q: I was told that I should leave my small suitcase on a luggage rack on the lower level of the sleeping car because there’s no room for it in my roomette. I’m worried that it will be stolen. A: Having items stolen in an Amtrak sleeping car is extremely rare. But you mentioned that your suitcase is small. How small? There’s a small step on the wall of the roomette to help you climb into the upper berth (at left in photo), but it serves quite nicely as a shelf for my modest-sized suitcase and I can even stack my small carry-on bag on top of that. Q: Am I supposed to tip the car attendant in an Amtrak sleeping car? And, if so, how much? A: Tipping is a matter of choice, of course but, like it or not, it’s also the custom. 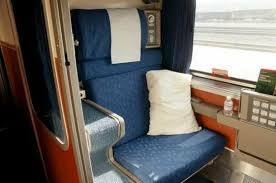 For car attendants on Amtrak long-distance trains, I recommend a minimum of $5 per person per night. If you take your meals in your room, I would tip another five bucks per meal per person. Q: I’ve heard some horror stories about traveling overnight in coach. If—God forbid—I get a problem passenger sitting near me or even next to me, what should I do? A: I guess it depends on how much of a problem the other passenger really is. For minor issues like someone chatting to loud on their cel phone, say something to the car attendant. For something more serious—someone who’s been drinking or is being aggressive—ask one of the conductors for help. If they’re not actually “walking the train”, you can probably find them doing their paperwork at one of the empty tables in the dining car or, on one of the western trains, on the lower level of the Sightseer Lounge Car. Q: I’m a senior and always take advantage of the 15% discount. Rumor has it that Amtrak is going to do away with all of the discounts they have offered for many years. Do you have any solid information on that? A: No I don’t. Not yet, anyway. The only recent change I know of is with the senior discount, which now applies at age 65, instead of 62. There’s lots of speculation, though. I’ll report it here as soon as I’m sure it’s official. Previous How Congress Escapes Blame. NextCutting It Close? Not a Good Idea. We are deciding if we should take the zephyr from Chicago to Sacramento or Chicago to San Francisco. We are attending a reunion north, so either city would be workable to rent a car from. My question is do we miss a lot by getting off in Sacramento? And which stations in both would be best to get off at? I guess it depends on whether or not you’re planning on doing much sightseeing in either of those two cities. Personally, I’d opt for Sacramento. The station is in a good location–within easy walking distance of Sacramento’s Old Town and the California State Railroad Museum, which is a fabulous experience. But that’s just me. Oh … if you really like Italian food, try Il Fornaio in downtown Sacramento. The removal of the diner from the Silver Star was actually a marketing tactic. Ticket prices on the Star were also reduced in an effort to attract more customers and, as a result, increase revenue. My information is not current, but the last I heard, the tactic seemed to have worked, albeit modestly. Thanks Jim, I prefer the dining car but understand it may be more economical for some. According to the Amtrak website, the 10% senior discount now looks to be official. Yes … along with an increase in the age limit from 62 to 65. 1. As you mentioned, the age for the senior discount is being raised from 62 to 65. 3. The student discount is being eliminated. Yes, the age 65 for seniors is already up on their website and the discount is now 10%. It appears that the student discount is no longer listed. As far as I know, there has not yet been any formal announcement for any of this. And that’s strange! Ha ha, maybe it’s hoped that not much attention will be given to it. Perhaps by quietly going from 15 to 10% it is felt that many will not pay attention. If however it completely dissappeared then it absolutely would. So it this point looks like the AAA, RPA (NARP) and senior discounts are all on a level playing field.